Ali Shallal al-Qaisi (Arabic: علي شلال القیسي‎) is an Iraqi who was captured in United States custody during CIA interrogation at Abu Ghraib Prison in 2003. 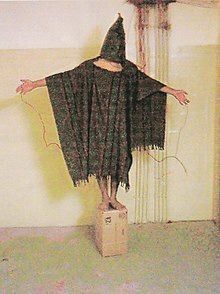 His name became known in 2004 when the Abu Ghraib scandal made news. Al-Qaisi said: "I'm spending sleepless nights thinking about the agony I went through... I even have recurring nightmares that I'm in my cell at Abu Ghraib, cell 49 as they called it, being tortured at the hands of the people of a great nation that carries the torch of freedom and human rights." According to Ali Shallal, he was arrested after he attempted to contact foreign reporters after American military seized a football pitch he owned to dispose bodies of those killed by them. ^ Perry, Tony (28 May 2005). "SEAL Officer Not Guilty of Assaulting Iraqi". Los Angeles Times. ^ "The Victoria Advocate - Google News Archive Search". news.google.com. Retrieved 2018-07-12. ^ Warrick, Joby (19 June 2008). "Exams Back Up Reports of Detainee Abuse, Group Says". Washington Post. ^ Arab, The New. "Inside Abu Ghraib: Meeting Ali Shallal al-Qaisi". alaraby. Retrieved 2018-07-12. Halaby, Jamal. "Former detainee blames trauma on US captors". washingtonpost. Perry, Tony (28 May 2005). "SEAL Officer Not Guilty of Assaulting Iraqi". Los Angeles Times. "A DEADLY INTERROGATION -- Can the C.I.A. legally kill a prisoner?". The New Yorker. 14 November 2005. "Other government agencies". Salon.com. 14 March 2006. Archived from the original on 2008-02-12. Morris, Errol (19 May 2008). "The Most Curious Thing". New York Times. Archived from the original on 2008-05-20. Retrieved 2013-03-14. This page was last edited on 11 October 2018, at 13:49 (UTC).